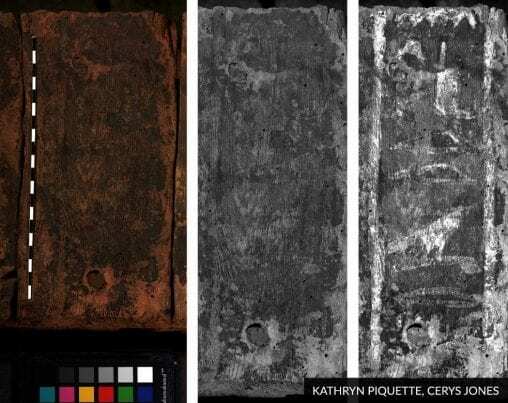 An article in CIPEG’s e-newsletter from October 2018: Investigating the Manufacture of Late 4th Millennium Decorated Palettes, in which Kathryn discusses Reflectance Transformation Imaging as a technique whose level of detail enables systematic assessment of carving techniques, tool use, skill, aesthetic principles, and artistic priorities. A book chapter: Piquette, K. E., 2018. Revealing the Material World of Ancient Writing: Digital Techniques and Theoretical Considerations. In: Hoogendijk, F.J. and van Gompel, S. (eds), The Materiality of Texts from Ancient Egypt . Leiden, Netherlands: Brill. Chiddingstone Castle ancient Egyptian coffin lid, probably 25th Dynasty. It’s been about a year and a half since UCLDH announced the establishment of UCL Advanced Imaging Consultants (UCLAiC, with a core team of Melissa Terras, Adam Gibson and myself) and began offering Reflectance Transformation Imaging and Spectral Imaging services from the UCL Multi-Modal Digitisation Suite research facility based in central London. We have since been undertaking imaging projects on a range of fascinating heritage materials. From Roman lead tablets and Egyptian mummy portraits to Persian and Mediaeval manuscripts and modern works of art, the advanced techniques we use are helping to reveal hidden writing, underdrawings and other marks that are difficult to see with the naked eye. 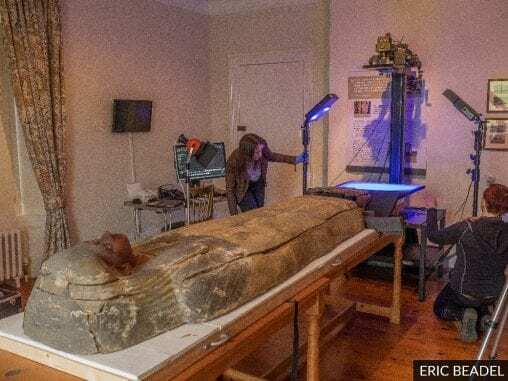 As we wrap up work from 2017, we are pleased to report on one of the highlights from the past years’ projects, namely multispectral imaging on a 2500-year old Egyptian coffin lid held in the collections of Chiddingstone Castle in Kent, England. This wooden lid, shaped to represent the human form, is covered with a thin layer of yellow gesso and the head and chest are embellished with red, blue and yellow paint. A column of hieroglyphic text runs down the centre of the lid, from the brightly coloured broad collar down to the feet. Intended to ensure the sustenance of the deceased in the afterlife, this offering formula is formed of hieroglyphic signs painted in black outline with a blue-green infill. The glyphs on the foot area, however, have become very faded and damaged over time – yet this is the very location where the name of the owner of the coffin would have been written. Lower part of the coffin lid showing preserved hieroglyphic text and largely ‘invisible’ name on foot panel. Keen to learn if the name could be recovered, Chiddingstone Castle commissioned me to conduct multispectral imaging on the damaged foot area. Our multispectral system (supplied by R. B. Toth Associates), uses a medium-format, 60-megapixel PhaseOne IQ260 Achromatic camera to take a series of high-quality digital images. Illumination is provided by low heat, narrowband light emitting diodes (LED) at 12 different wavelengths from ultraviolet to near infrared, with the application of a 6-position motorised filter wheel (developed and integrated by Dr Bill Christens-Barry of Equipoise Imaging). Together with the assistance of SEAHA PhD student, Cerys Jones, the multispectral system was transported from the UCL Multi-Modal Digitisation Suite to the Castle in order to conduct the imaging onsite. Cerys Jones and Kathryn Piquette calibrate the UCL multispectral system. We applied 12 different wavelengths from ultraviolet to near infrared. Initial results were achieved using infrared (IR) illumination. These wavelengths, which are longer than visible light, are absorbed by carbon-based inks/paints and thus provided increased contrast between the outlines of the hieroglyphs and the surrounding surface. Thanks to the flexibility of our MSI system and Cerys’ familiarity with the specific optical properties of the pigment Egyptian blue, we tested further combinations of wavelengths and filtering. Visible induced infrared luminescence (VIL) proved vital for visualising the faint traces of paint surviving in the interior of the hieroglyphs, and we were thrilled to successfully recover the shapes of the majority of the hieroglyphs spelling out the deceased’s name. Cerys Jones and Kathryn Piquette examine the multispectral imaging results. With this image data in hand, I was able to research the name and, with the assistance of other Egyptologists, determine that the hieroglyphs most likely spell out “Irethoreru”. This name was relatively common among males during the 1st millennium BCE and can be translated as “The Eye of Horus is against them”. The name was presumably intended to protect its bearer against his enemies, although without specifying whether these enemies were material or otherworldly. UCLAiC are pleased to have contributed to the re-discovery of the name of this ancient Egyptian who lived over 2000 years ago. This exciting work also recently appeared as part of a BBC report on UCL’s research on non-destructive technical imaging for recovering ancient hidden writing (see also: UCL News) and is also reported on the SEAHA blog. Detail of foot panel under visible light (left), infrared (IR) illumination (middle) and visible induced infrared luminescence (VIL, right). While the mystery of the name has been solved, there is yet much to learn about the Chiddingstone Castle coffin lid. It was acquired by Denys Eyre Bower in the mid-20th century but unfortunately its original provenance is not known. The lid is probably part of an outer coffin that held an inner coffin which, in turn, held Irethoreru’s mummified body. One wonders whether elements of his burial equipment made their way into other UK/European museums and collections. Indeed, many Egyptian artefacts from the Third Intermediate Period and beyond (c.1000–c.300 BCE) bear the name “Irethoreru” (which may also be rendered as “Iret-hor-irou”, “Iret-horru”, “Iret-[en]-Hor-eru” or “Iretenhoreru”). Further detailed research, advanced imaging and materials analysis will be necessary to discover whether any of these funerary objects relate to Chiddingstone Castle’s Irethoreru. 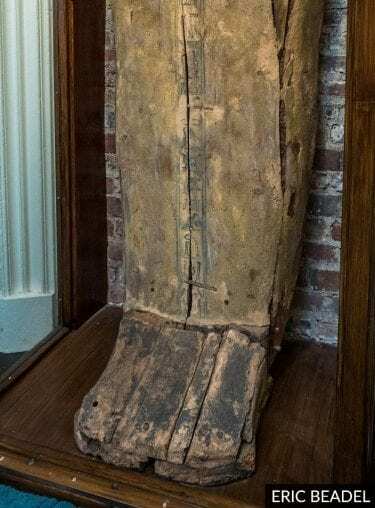 If you think you might have further information that could help Chiddingstone Castle learn more about their coffin lid please contact: curator@chiddingstonecastle.org.uk. For further information about the imaging services and training courses offered by UCLDH Advanced Imaging Consultants, please visit the page or contact advancedimaging@ucl.ac.uk! We are rolling out our new Reflectance Transformation Imaging (RTI) training course! There is more information available, including pricing and how to register. UCL Centre for Digital Humanities are pleased to announce that we now have capacity to offer Reflectance Transformation Imaging and Spectral Imaging services from our Multi-Modal Digitisation Suite research facility based in central London. Reflectance Transformation Imaging (RTI), also known as Polynomial Texture Mapping (PTM), is a high-resolution, non-invasive and non-destructive imaging technique for documenting fine surface details. Unlike conventional photographs, images created using the RTI capture method can be virtually relit. The direction of the light source can be moved around in real time to give 3D appearance to surface shapes for systematic inspection of fine surface details. Spectral Imaging is a high-resolution, non-invasive and non-destructive form of computational photography that can disclose features of the object that are invisible to the naked eye in natural light, and can enhance faded writings, reveal palimpsest and under-drawings, as well as aiding in pigments, binders and other materials identification. Spectral imaging helps clarify and support research, scholarly and other goals. The UCL state-of-the-technology spectral imaging system can be applied to documents and manuscripts, polychrome artworks, and a range of archaeological and heritage objects. • Forensic evidence or any object/surface requiring detailed examination. For further information, please see our UCLDH Advanced Imaging Consultants page or contact advancedimaging@ucl.ac.uk.